Shouldn't a housing bust have the opposite effects of the housing boom? The party line about the economy is that the housing boom was a time of inefficient excess. Shouldn't a period of low housing investment bring efficient prodigality: that is, MORE GROWTH FOR GDP AND EMPLOYMENT and less growth for consumption? Why then does the party line feature gloomy predictions for real GDP and employment growth going forward? 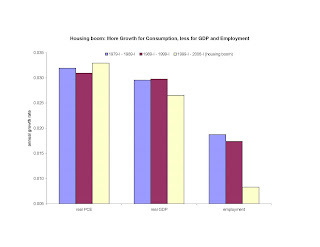 Make up your mind: was the housing boom efficient, or not? Do we want to relive those years, or not? If life after the housing boom is so bad, then let's not criticize the economic performance during those years. There is some empirical support for the housing boom party line, and therefore data that calls into question the gloomy predictions for real GDP going forward. The chart below shows that real consumption (PCE) growth was somewhat greater during the housing boom than during the previous years. Real GDP growth and employment growth were less during the housing boom than during the previous years. A related contradiction in the party line is that it was unhealthy for there to be lending to people with bad credit scores. But now it's considered a problem that today (according to the party line) only persons with good credit can obtain loans! Which is it: does a healthy economy provide subprime credit, or not? P.S. First estimates of GDP growth 2008 Q2-Q3 will be released later today. Obviously, one quarter does not make 7-10 year time frames like I studied above. Other than saying that employment will not fall below 134 million and that real GDP (chained 2000 dollars) will not fall below $11 trillion, I do not have any prediction about today's release (read the specifics of my predictions here). Some reporters for the New York Post tried to prove the existence of a credit crunch by going out to apply for loans. Loans for housing, loans for autos, loans for boats .... One problem -- their loan applications were approved (one of the 5 was formally denied, but even in that case the banker said that the money could be obtained through a credit card application)! Read about it here: "To loan seekers in Manhattan last week, the credit crunch seemed nowhere to be found." The U.S. Treasury now proposes to spend some of its $700 billion authority – $250 billion to start – to purchase equity in struggling banks. This proposal echoed the proposals of a number of academics. However, in the haste of developing this plan, few have considered the fact that Treasury capitalization will reduce private capitalization, with little net effect on the overall capitalization of the industry. It is a known fact that the private sector has itself been looking seriously at recapitalizing banks, with some investors already committing cash. Within the past year, the Abu Dhabi group purchased a large stake in Citigroup. Bank of America announced early this month that it would issue more shares in the amount of $10 billion. Mitsubishi is acquiring a stake in Morgan Stanley. Most of us would guess that JP Morgan Chase would raise capital even without the Treasury’s help if it found additional lucrative opportunities to expand. One calculation found that banks have already raised over $400 billion. Even if existing banks could not attract capital on their own, their inaction creates opportunities for other institutions to commit capital to funding investment projects in our economy. Walmart would like to get into the banking business. Pension funds, university endowments, venture capitalists and corporations all bring money to new investment projects. For example, a profitable corporation (there are many of them these days), could cut their dividend in order to fund projects that would have otherwise been funded by a bank. Do not assume that the private sector funds are invariant to Treasury actions. Rather, the private sector has both the means and the motive to neutralize Treasury purchases. If, say, Bank of America gets $10 billion from the Treasury, they can change their minds about their plan to issue $10 billion in the private sector (or maybe they anticipated this purchase, and without it would have planed to raise $20 billion). Even if it were true that there were some banks that were not raising private funds because their shareholders want their money out rather than throwing good money after bad, Treasury investments could still be readily neutralized by the private sector. For example, banks could use their new-found Treasury cash to buy back shares! Or they could use that cash to raise the dividend, or to put off a dividend cut that they had planned. The Washington Post called the dividend-hike possibility “the biggest hole in Treasury's financial plan,” although basic economics suggests that there are many large holes of this character. Yet another hole of this type is for one bank receiving Treasury cash to buy the shares of another bank on the open market. Two see how this is equivalent to dividend payments and share buybacks, consider two scenarios. In scenario A, the Treasury buys stock in Bank ABC, after which bank ABC takes the Treasury cash to buy its own shares in the open market. Scenario A ends with bank XYZ's buying bank ABC in exchange for XYZ shares. In scenario B, the Treasury buys stock in Bank XYZ, after which bank XYZ purchases bank ABC for cash. In both scenarios, the Treasury ends up with XYZ shares. In both scenarios, bank ABC shareholders end up with Treasury cash. In both scenarios, there is no impact on the capitalization rate or the loan portfolio of either bank. The only difference between scenarios A and B is that the latter makes it slightly less obvious that the Treasury cash is going straight to bank shareholders. Treasury Secretary Henry Paulson has said the money was aimed at rebuilding banks' reserves so that they would resume more normal lending practices. But reports then surfaced that bankers might instead use the money to buy other banks. Indeed, the government approved PNC Financial Services Group Inc. to receive $7.7 billion in return for company stock and, at the same time, PNC said it was acquiring National City Corp. for $5.58 billion. Remember that it is unclear whether the Treasury will vote along with the other shareholders, let alone micro-manage bank operations. If bank shareholders want cash in their pocket rather than loaning it out, there are strong market forces (not to mention fiduciary responsibility) pushing bank executives to pay out the cash. Even if by luck or judicious micro-management the Treasury were to prevent these payouts, the flow of private sector funds toward funding new projects would still be reduced, thereby offsetting the Treasury investment. In this case, the banks receiving the Treasury investments would cede less business to new entrants to the banking industry and to alternative institutions that fund investment projects. For example, profitable non-financial corporations would no longer have to cut their dividend to finance their projects, because they could obtain the funds from one of the Treasury-partnered banks. The total amount of funds available for investment projects is just the same. Bush, Paulson, most economists, and I agree that a nationalized banking sector is by itself undesirable. But the Treasury purchase plan is going forward because the purported benefits – a more capitalized banking industry – outweigh that cost. The purported benefits will never materialize because private capital is pulling out -- and will continue to pull out -- of the banking sector to make way for Treasury capital. Do you remember this entry from 3 weeks ago? I said that housing prices had 27% more to fall. Last Friday, Luke and I wrote "...as of July 2008 housing prices more to fall in order to reach the real value they had for several years prior to the boom" and that the fall would be about 30% relative to the PPI. Today the Case-Shiller index for August 2008 was released, and its value fell 2% from the previous month and 28% from the prior year. Chicago housing prices have fallen much less over the past couple of months: the Case-Shiller Chicago index has fallen only 2.5% over the last 6 months. Slow rates of Chicago decline are expected because Chicago prices were closer to construction costs, although the rates are so slow that it makes me wonder whether Chicago will ever get back to 1999 levels of (housing price)/(construction cost). If you do not mind having nightmares, I recommend reading Professor Mankiw's article comparing the McCain and Obama tax plans. He calculates that, relative to McCain's, Obama's tax plan almost triples the price of his children's consumption after the good Professor is dead. He takes the candidates' tax plans literally. Doing so is, of course, appropriate for the purposes of evaluation and debate. But taking candidates literally is ridiculous for the purposes of forecasting. Just as we know that Coke and Pepsi are far more different in marketing than they are in chemical composition, we know that Democrats and Republicans are far more different in rhetoric than in practice. The president is not a dictator (even dictators aren't dictators, but that's another story) -- the winner Nov 4 will have to deal with the same Congress, interest groups, and ultimately re-election as would the other candidate if he had won. Second, most of the price-tripling result comes from the capital tax side. Because Professor Mankiw expects to live about 35 more years, the President during the next eight is hardly relevant. Indeed, if it were true that Obama would be a heavy taxer, Professor Mankiw and his kids might be better off if Obama gave a vivid demonstration of the harms of heavy taxation before they realized their capital gains in the year 2043. Third, even if it were true that Obama and McCain would set labor tax rates that were consistent with their rhetoric, I am even more dubious that capital tax policy would follow that rhetoric. Look at western European countries. They have a lot more socialist talk than the U.S. does, and have some hefty labor tax rates to back it up. But their capital tax rates aren't so high. For a decade now, U.S. Republicans have been pointing to western Europe as a model of corporate taxation. Fourth, capital taxation will likely be driven by the politics of elderly baby boomers. Unless one of the candidates plans to exterminate baby-boomers, they both will have to deal with them, as will the next several of their successors. For example, hiking the capital gains tax may work in the short run because the baby-boomers don't have any. But eventually they will (if nothing else, inflation will deliver some), and any good politician (regardless of party) will float a capital gains tax cut in order to obtain baby-boom support [I don't claim to know everything about the politics of capital taxes --- my point is that these politics are subject to the fundamental forces of supply and demand, which cannot be altered by the political party of the president]. My forecast: an Obama victory would be good for Professor Mankiw's kids (http://www.econ4obama.com/). Yes, I expect there would be an infinitesimally larger price of their consumption and, therefore, they will spend just a bit more time with Dad than they would have under McCain. Maybe kids and father can use that bit of extra time together to enjoy President Obama's eloquent and memorable (and, admittedly, substance-free) speeches! I am not a fan of the blame game. However, regardless of what public policy actions might follow, determining the fundamental cause of the housing price crash is necessary to understand where the economy is headed. Let me give three hypotheses, and demonstrate how each of them affects what we should be forecasting for the future. Hypothesis F ("F" for future): During the boom the housing market expected (rationally or otherwise) that housing demand would be high in the future. That is, unless housing construction were far above pre-boom rates, there would not be enough housing to satisfy demand in 2007, 2008, 2009 and beyond. Based on the expectation, housing construction proceeded at a furious pace. Once we learned that the future demand wasn't there, we were worse off because those houses couldn't be unbuilt. This ultimately false expectation cost America -- according to my forthcoming (hopefully by Monday at papers.nber.org) paper "Market Responses to the Panic of 2008" the losses were in the trillions. These losses will cause people to work more and, through that channel, will raise GDP. Hypothesis P ("P" for present): Suddenly, people no longer found housing to be an important priority. The scenario has some of the losses as with Hypothesis F (and thus the work stimulus), except that GDP may fall to the extent that actual housing/apartment rental rates are lower (recall that part of GDP is the rental value of housing) and this dominates the work stimulus. In the scenario above, actual rental rates do not fall, it's just that people revised their expectations about future rental rates. Hypothesis G ("G" for government distortion): The boom was caused by a distortion (induced by the government, or otherwise) of capital away from the nonresidential sector. It is good news that the distortion finally ended; the housing price crash is just an indicator that things are getting better. Our economy can use its resources more productively. This may ultimately raise GDP, but through different mechanisms: productivity will be higher, work will be induced by a substitution effect (rather than a wealth effect), and we may even be able to obtain the same government revenue with lower tax rates (recall that the housing sector is a major area for tax avoidance). 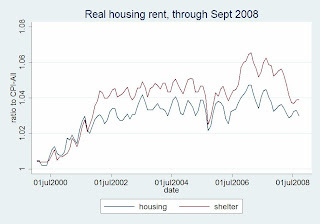 The housing rent data tell me that Hypothesis P is not important. Notice from the graph that the inflation-adjusted rents paid by persons living in houses and apartments are essentially as high now as they were during the boom, which themselves were not that high. I don't yet know which of the remaining hypotheses is more important. I do not get the sense that America is saying "Finally! We can do things more efficiently!" so I have started pursuing the logical implications of Hypothesis F. But I have to start somewhere, and will report back when I have given more thought to G and/or have evidence on its relative importance. In today's New York Times, Professor Mankiw writes "... it’s hard to avoid seeing parallels (with the Great Depression) to the current situation." Conspicuously absent from the article are specifics about the parallels he sees (not to mention the lack of a conceptual framework -- supply and demand maybe?! -- to understand what fundamentals are even worthy of comparison, but that's another topic). He points out that consumers are scared. I agree. Anything else? He points out that that many banks failed during the Great Depression. But those bank failures came well after the economy was severely depressed. Friedman and Schwartz (p. 306) explain how the economy had already declined very significantly by October 1930: "Even if the contraction had come to an end in late 1930 or early 1931 ... it would have been ranked as one of the more severe contractions on record." That's it. That's all the parallels he mentions about the two economies! He has an interesting discussion about how economists might be in a similar situation today as there were then. I'm not sure that I agree, but anyway this blog is about the economy, not economists. 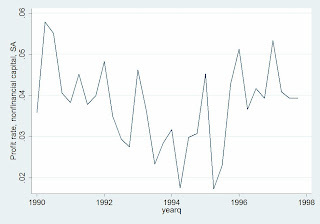 GDP had grown at least through 2008 Q2. Friedman and Schwartz (p. 306) explain how the economy had already declined very significantly by October 1930: "Even if the contraction had come to an end in late 1930 or early 1931 ... it would have been ranked as one of the more severe contractions on record." The Midwest grew corn very high this year, and was a dust bowl in the 1930s. Bank deposits increased during this year's financial panic, they fell during the 1930s (Friedman and Schwartz, Chart 27). Today's failed banks are gobbled up by large investors from around the world. In the 1930s, many of them just failed. Today bank lending rates are falling; in the 1930s they were not. I have explained in a number of places how, in theory, the banking crisis need not have much impact on the non-financial economy. I have notified readers of this blog of various pieces of evidence related to my hypothesis. As I noted in an earlier post, I am wondering whether (2) is bank-driven or customer-driven. Nevertheless, it seems at odds with the simple view that banks are just cutting off credit. I would not have guessed (4), which raises an interesting question: if we ultimately conclude that the banking crisis did not impact the nonfinancial economy, is it because (a) the banking sector does not significantly impact the nonfinancial sector, or (b) the crisis is not even a big deal within the banking sector, or (c) both? Please note that Professors Chari, Christiano, and Kehoe and are affiliated with the Federal Reserve Bank of Minneapolis. They are more qualified than I (or, if not, have ready access to Fed personnel who are) to appreciate the intricacies of Federal Reserve data. Their findings should be given significant weight. I have given some multi-billion dollar examples of how businesses continue to fund new projects despite the so-called credit crunch. There are remarkably few counter-examples. I have a friend who has some lake property, against which he took out a callable loan and has faithfully made the payments. The loan was just called. I'm not sure this is a counter-example (is there a good project he can't fund because of the loan call? ), but I mention it because it's one of the only anecdotes I have that might suggest that the bank crisis is even trickling out to the wider economy. CNNMoney.com has a story of 12 small businesses during the credit crunch. I was really eager to read this one, anticipating that I'd learn about real-live small businesses that are unable to fund good projects because of this month's banking crisis. Well, I was disappointed. Of those 12 businesses, many reported that their troubles began a year ago. Others report that they are doing great, and are just worried that, someday, a credit denial will get in the way of their continued success. One business owner had been continually denied credit for the last four years -- so this month was nothing special! Only the boogie board shop owner provided a possible counter-example: he said that his sales would be $2 million/year rather than $1 million/year if his credit line had not been frozen. If all I can find to counterweight my multi-billion dollar examples is a boogie-board entrepreneur and one called lake property loan, I'm going to have to conclude that the credit crunch is not significantly impacting the real economy. Given that the news media hungers so intensely for such examples yet still cannot produce them, what else can we conclude? You heard it here first. Then the Washington Post. Now Professors Scharfstein and Stein explain how the Treasury Bailout Plan is less potent than you might think. My editorial "Is the Treasury Impotent?" on this topic is still sitting at at a newspaper op-ed page for their consideration. I will post it here soon. Democrats are supposedly the ones who "help" the poor. Measured in terms of the fraction of people who are not obligated to pay income tax, hardly any progress was made during the Clinton years. It was two laws passed under the current administration that exempted large numbers of poor from the income tax. Professor Mankiw reminds us that Democrats renege on campaign promises too (see here for Republican examples): President Clinton changed his mind about "middle class tax cuts." By the way, the phenomenon that Democrats and Republicans have essentially the same public policies is evidence that our political system is pretty efficient. If Democrats and Republicans actually differed as much as their rhetoric does, public policy would wildly shift every time there was a change in the party in power. Wild policies shifts would be bad for the economy. If instead Democrats and Republicans were blunt and said "Ultimately, I'll do essentially the same thing as my opponent does" (McCain and Obama are almost this blunt when it comes to policies related to the financial crisis), the political process would lose its value to many people. I might call it "entertainment value," but that sounds pejorative. It's more like the difference between Coke and Pepsi -- they might be chemically indistinguishable, but consumers would not be well served if Coke said "our drinks are essentially like Pepsi's" and Pepsi said "our drinks are essentially like Coke." Indeed, I wrote an earlier post to cheer up the November 4 losers, but it may have the opposite effect because there is value to imagining that your favorite brand is unique. Many people look at the Democrat and Republican brands that way. Candidates Obama and McCain often sound different when it comes to describing their public policy plans (although not always: both sounded the same -- that is, silent -- when Congress took $700 billion from Americans to bail out Wall Street). I like McCain's sound better than Obama's, because Obama more often talks about policy proposals and policy philosophies that don't make a lot of economic sense. But it would not be good for America to have a president chosen merely on the basis of how the candidate's rhetoric sounds to Casey Mulligan. I think it is clear that a lot of people -- probably less than half, but still a lot -- like Obama's sound better. Moreover, the Obama fans are INTENSE about their preference. That intensity ought to count in the political marketplace. You might say that Obama's nice (to many) sound should not outweigh the bad policies he will implement. That's a good point, but irrelevant. Just because Obama more often talks about bad policy proposals and policy philosophies does not mean that he would actually implement them. The Democrat-Republic rhetorical gap is vastly wider than their policy gap. I estimate that an Obama presidency would, relative to a McCain presidency, reduce economy efficiency by less than $50 per person per year (you can read about the details here, but please wait until Nov 5). That small loss in economic efficiency is almost outweighed by Oprah Winfrey's enthusiasm alone! Seriously, judging from campaign contributions and rally-turnouts, I think it is likely that the intensity of preference felt for Obama by a significant minority of America is worth $50 per person per year. P.S. Let me add that Professor Goolsbee is a good economist (being a good economist got him in trouble in Canada). So Republicans do not have a monopoly on having good economists in house. Today's banks suffer from a crisis of solvency; 1930s banks suffered from depositor-runs (see Anna Schwartz). Today we have inflation (so far); in the 1930s there was deflation (both before and after the bank panics). Please let me know if you see any further similarities or differences. It has been alleged that banks these days are unable to loan to their business customers. A reduction in the supply of bank loans to businesses should decrease the quantity of bank loans to businesses and increase the interest rate on those loans. Whether most of the bank-loan-supply shock shows up as higher rates rather than lower quantity depends on the elasticity of demand for bank loans (I think that the elasticity of demand is high because there are good substitutes for bank credit, but put that aside for the moment). I just posted information on the amount of bank lending, which shows evidence of bank customers' hoarding liquidity, but does not suggest that banks have reduced lending (a reduction might be hidden in the data somehow, but if the effect were hidden you have to wonder how big it really is). Now take a look at banks' prime lending rate. It rose during the housing boom and was flat or falling since the housing crash. It was just cut another half percentage point less than two weeks ago. That tells me that major bank customers had to compete with residential loans during the boom, and now they no longer do (the prime rate also follows the fed funds rate -- I'll leave it to another day to discuss whether supply and demand determines that rate, as opposed to the fed itself). If a bank does not intend to lend, why doesn't it at least charge more on the loans it does make? You might say that it has to compete with other banks, but that's both true and proves my point. Banks DO intend to lend: they cut their rate to retain and attract customers. tried to increase their short-term assets rather than make loans. The small commercial banks (in the aggregate) had much smaller balance sheet changes. I am still digesting this (you can read it at the Federal Reserve www site), but I suspect that much of the loan increases are "passive" -- that is, banks had already committed to customers that they could have access to credit and those customers took full advantage (i.e., it is the bank customers who are hoarding liquidity). Likely that is why deposits increased so much: bank loan customers just turned around and made deposits. Nevertheless, it is notable that banks honored their commitments, and then stand to make an easy profit as their customers receive less interest on the deposits than they pay on the loan. Interest rates are also coming down (see my next post). Thus, it is difficult to see any effect on the supply of bank loans to the nonfinancial sector in either the quantities or in market prices. If this financial crisis were such a big deal for the nonfinancial sector, why is it so hard to see in the banking statistics? U.S. factory production was very low in September. It is important to recall that two major storms hit the U.S. in that month -- Gustav and Hanna -- and that there was a strike at Boeing. Significant events like these are unlikely to occur in 2008 Q4, 2009 Q1, or 2009 Q2. Furthermore, the economy quickly rebounds from these events. Thus, we should be careful not to extrapolate the rate of economic growth measured through September 2008 into the future. We should also be careful to evaluate economic growth measured FROM September 2008 with the understanding that some "rebound" is to be expected as factories clean up after a hurricane or strike. This story suggests that most of the measured drop August-Sept in industrial production should be attributed to the hurricanes and the strike. Professor Mankiw has a great supply-demand-based discussion of Obama's health plan tax. I hope Greg is correct, but he may not be. Republicans, please do not read what is written below unless you want to have nightmares. Obama plans to tax employers who do not offer health insurance. Professor Mankiw rightly points out that employers may want to react by paying their employees less. However, the law may get in the way of having wages lower than they would be in the absence of the tax because those wages were already at minimum wage (this was the point of Steve Trejo's dissertation written at Chicago about 20 years ago). You might say that most jobs already pay above the minimum wage, so that Trejo's analysis rarely applies. However, I bet that the jobs without health insurance coverage are much more likely to be minimum wage than would be the average job. Furthermore, don't forget that Obama and a Democratic Congress could raise the minimum wage, and thereby invalidate your claim that most jobs already pay above the minimum wage. Yes, I did let my six-year-old son watch "Jaws" before we went fishing. I have mentioned that venture capitalists are one of the substitutes for banks. So it is a problem that their 3Q startup investment activity is down 9%? Yes, I would like to see venture capitalists expand their role. But not necessarily in funding startups, but rather to expand their role in funding investments that would have traditionally funded by banks. The story cited above does not discuss whether venture capitalists are doing, or considering, such a new role. I have already discussed how savers are less willing to hold the same dividend streams. In other words, maybe savers want to invest less in risky activities. If so, startup funding (of which venture capital startup funding is part) would be down regardless of what happened to banks. The question is whether the decline of banks has caused venture capital to decline less than it would have. I have noticed that the NASDAQ is down about the same as the S&P 500. However, the proper comparison would be the market value of S&P 500 capital as compared to the market value of NASDAQ capital -- that is, including the market value of the bonds of these companies. It is my impression that NASDAQ capital is less leveraged, so an equal percentage decline in NASDAQ and S&P means that the market value of NASDAQ capital fell by a greater percentage. See this story. I have to admit that I didn't predict this -- more specifically I didn't predict that bankers would be so quick to admit what supply and demand predicted from the beginning! Japan's banking crisis began no earlier than 1993, because Japanese banks were making profits prior to that, and were taking losses 1993 through at least 2001 (Kashyap, 2002, Table 1). I am still double-checking this, but it seems to me that non-financial capital was already in sorry shape by then. The attached graph shows non-financial sector net operating surplus per dollar of capital in the non-financial sector (seasonally adjusted by taking residuals from a regression on quarter dummies). It reached its lowest in 1993 and 1994. In the U.S., by comparison, banks began taking significant losses in 2007. The non-financial sector was quite profitable then, and continues to be. The high U.S. marginal product of capital not only raises the growth rate forecast from which to subtract any adverse impact of liquidity crisis, but also reduces the expected magnitude of that impact. Imperfect information plays a role in our economy. For example, a person diagnosed with a fatal illness may like to purchase life insurance for his family even if he had to pay an actuarially fair (thereby, high) price. But life insurance companies will not sell insurance to such a person because the cost of verifying exactly how fatal is his illness (expensive doctors and testing would have to be hired) exceeds the patient's willingness to be insured. Imperfect information cannot stop a transaction with billions of dollars of benefits unless the costs of verifying that information is even greater than that. Professor Kashyap and Diamond are blaming lack of troubled bank equity sales on imperfect information. Specifically, they say that a fairly strong bank would fail to raise equity because investors fear that the bank is actually quite weak (i.e., have some hidden troubled assets). They error both in fact and in logic. In fact, troubled banks have raised some equity from the private sector, which demonstrates that information problems have been overcome in this situation. Regarding the logic, their story has some sense to it if it were a story about a small bank. But they are applying that story to the large banks (such as those receiving the "equity injections" from the U.S. Treasury) who have hundreds of billions of dollars in assets. Whatever private information those bank managers have could be made sufficiently public (or revealed to a single large scale investor) or sufficiently incentivized for far less than billions of dollars. I suppose that the Professors would say that "it takes too long to make those discoveries." Where is the evidence for that claim? How many hours did the bank managers currently (and allegedly) holding the private information take to acquire it in the first place? Haven't some of these banks known for months that they would need more equity -- why weren't those months long enough to sufficiently publicize the private information? Why can't some of the managers in-the-know be made part of a new investment group and thereby given an incentive to blow the whistle? A lot of problems can be sufficiently solved in short order when there are billions at stake. A more coherent story for the lack of equity sales is that the cost of capital is too high (many investors do not want to own bank stock regardless of what a detailed audit would show) and, even if it weren't, subsidized public capital is on the horizon and raising private equity would make them less eligible for the subsidy. Until Lehman failed, I and most of the world had not realized that Fall 2008 would be the time when commercial paper markets would freeze, some major commercial banks would fail (or be gobbled up moments before failing), or that the once-libertarian economist Bernanke would propose spending circa $1 trillion of taxpayer funds helping the banking sector. One story commonly told after the Lehman failure is that banks would cease lending, and this would take a sharp bite out of national investment, which in turn would bring down the economy. Since then, we have been waiting with anticipation to see what would happen to the economy as a whole. It is quite possible that we do not have to wait. Suppose that, while most of the world did not anticipate these events, the troubled banks themselves understood this much earlier this year. I cannot guarantee you that the troubled banks knew this, but it seems very likely that they did. After all, they were involved in the daily operations in a way that most of the world was not. So let's pursue this possibility to its logical conclusion. We already have data for Q1 and Q2. Residential investment was down, of course, following the downward trend that began mid-2006 when housing prices peaked. 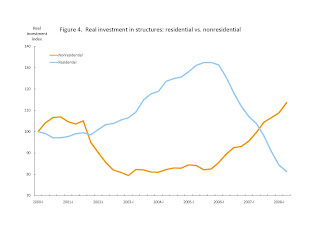 But non-residential investment was UP (a bit), not down. In 2008 Q3, gross nonresidential investment was 4.64% of the capital stock, as compared to 4.55% a year earlier and 4.58% two years earlier. Economy stalls, but Google's 3Q profit still rises. This article offers zero evidence for the "economy stalls" part. Honeywell 3Q profit rises 16 percent. JPMorgan Chase beats estimates with an 84 pct profit drop, revenue is worse than expected. But they still have profits! And their profit drop didn't stop them from acquiring WaMu. Wells Fargo profit falls 25 percent. Again, they have profits. And their profit drop did not stop them from outbidding Citigroup for Wachovia. Citigroup posts another loss. They have losses. Interestingly, these losses (among the biggest in the industry) did not prevent them from bidding for Wachovia although, admittedly, they could not outbid Wells. Insurer UnitedHealth reports 3Q profit drop. Still have profits. I see no evidence here that a credit crunch is getting in the way of important business. In case you want to weight these items, note that total earnings for the quarter are $2.8 billion (IBM), $1.89 billion (Coke), $0.12 billion (Hershey), -$0.24 (Contin), $2.7 billion (Nokia), $1.35 billion (Google), $1.53 billion (Sch), $0.92 billion (Honey), $0.53 billion (JP), $1.64 billion (Wells), -$2.8 billion (Citi), $0.92 billion (UnitedHealth), -$5.2 billion (Merrill). I never said that it would be pretty for the FIRE industry! As recently as 2008 Q2, corporate earnings were quite high by historical standards. This by itself predicts high rates of economic growth -- the baseline from which we can subtract any adverse growth effect of the today's so-called credit crunch. Moreover, corporate profits are an important substitute for bank loans (see my earlier posts). So an economy with high corporate profits is probably more resilient to banking sector failures than would an economy with low corporate profits. According to Friedman and Schwartz' A Monetary History of the United States, the first (short) banking crisis of the Great Depression was in November 1930 and, in Professor Lee O'Hanian's words, "The first banking crisis of any national significance didn't occur until the fall of 1931." Regardless of which date you choose, the economy was already in bad shape. Friedman and Schwartz (p. 306) explain how the economy had already declined very significantly by October 1930: "Even if the contraction had come to an end in late 1930 or early 1931 ... it would have been ranked as one of the more severe contractions on record." The marginal product of capital was above average in 1929 (although not nearly as far above the average as we are today). Maybe that means that, absent crop failures, etc., the economy might have grown well otherwise. Maybe that means that the 1929 economy would have been resilient to a severe bank panic. But I see 1931 as the more relevant comparison, because in the fall of that year the serious bank panics began. The 1931 marginal product of capital was 2.5%/year less than it was in 1929. By 1931, there were not extraordinary corporate profits that could be rolled back into corporations as a substitute for bank funding. The low 1931 marginal product of capital was by itself predicting a low rate of subsequent economic growth. In summary, the marginal product of capital in the months prior to today's liquidity crisis was much higher than it was in the months prior to the 1931-3 bank panics. This not only raises the growth rate forecast from which to subtract any adverse impact of liquidity crisis, but also reduces the expected magnitude of that impact. I don't know much about international trade theory, so it is a testimony itself that I have known about and admired Professor Krugman's work on that subject. Take a look at Professor Glaeser's explanation of why Professor Krugman is a highly deserving recipient of the prize. My goal is to make the application of supply and demand be both accurate and accessible. Time does not permit me to respond to the comments individually, but I read them. A large fraction of the comments have helped me make improvements in that direction -- thank you!! There are two shocks supposedly hitting the non-financial sector (which is most of our economy) as a result of the banking crisis. One of them is an adverse saver-investor intermediation shock. That is, the return to saving is low even while the cost of borrowing is high. The second shock is one of "confidence" (and also recognition that the stock market has crashed) -- an adverse wealth effect on consumption and leisure. These two shocks have exactly the opposite effects, which is why I am much less confident than the rest of America that GDP will fall as a result of the last month's events. I have argued that the intermediation shock is not that large, and at worst short-lived, because the entry motive pushes toward reducing that shock. Nevertheless, I will analyze it as if it were quantitatively important. By itself, this shock INCREASES consumption, because the alternative (saving) does not look as attractive. It decreases investment and raises the marginal product of capital because the cost of capital is temporarily high. Capital is fixed in the short run, so any effect on GDP has to come from labor supply or productivity. Labor supply should fall due to an intertemporal substitution effect (i.e., working hard is one way to save, but now is, according to the theory, not a good time to save). This effect may not be large, because there are other intertemporal substitution effects to worry about (e.g., Obama's winning the election and eventually hiking tax rates). Productivity will be down somewhat, only because the banking sector is terribly unproductive and the banking sector is part of the aggregate. So the intermediation effect will reduce output in the short term, but increase output post-crisis above what it would have been absent the crisis. Owners of equities are undoubtably poorer now than they were a year ago. Even persons who do not own equities may fear an eventual reduction in their labor income. This INCREASES labor supply, DECREASES consumption, and increases investment (with an ambiguous effect on the marginal product of capital). For example, baby boomers may delay their retirement because their 401k values no longer afford them as comfortable a retirement. This increases output now, and post-crisis compared to what it had been absent the crisis. You may have read in the newspaper that consumption is 2/3 of GDP, so that a reduction in consumer confidence reduces GDP by reducing consumption. But, not surprisingly, that analysis ignores supply (that's why I call this blog "Supply and Demand (IN THAT ORDER)"). Baby-boomers are productive, knowledgeable people. If they stay in the workforce rather than retiring, that will result in more output, not less. Do you remember way back in 2005 when Walmart tried to enter the banking industry? They ran into one little problem: the Washington buzz-saw operated by banking industry incumbents to create barriers to entry. You do not have to believe my version of the story: just read it at Business Week or MSN.com, among other places. Do you think the banking industry would be poorly capitalized today if Walmart were a major player? Do you think Treasury policies today will suddenly reverse this course? At least ONE economist needs to join me in reminding the public of the virtues of free entry. This week the Treasury has proposed spending some of its revenue purchasing equity in struggling banks. This proposal echos the proposals of a number of academics, including Professor Mankiw. But not this academic! I voiced some objections in an earlier blog post about the Profitable Government Enterprise Myth. I omitted another caveat -- that Treasury capitalization would recapitalize the banking industry MUCH LESS than each dollar expended by the Treasury. I was hoping Professor Barro would voice this opinion, because I learned it from him (not in 2008, but back in 1989 when I enrolled in his courses). Quite simply, Treasury capitalization will crowd out private capitalization. To see this, assume for the moment that future taxes are lump sum (with a known incidence) and the economy is closed -- i.e., that all potential bank stockholders are also U.S. taxpayers. Professor Barro has explained that taxpayers will recognize that the Treasury has invested more in bank stocks, and has implicitly done so on their behalf because the taxpayers will reap the gains and pay the losses of those investments. As a result, taxpayers will attempt to reduce their holdings of bank stocks by the same amount that the Treasury increased them. You might say that taxpayers cannot reduce their investments in bank equity, because those investments are already zero. If you say this, you err both in fact and in logic. In fact, Bank of America announced this week that it would issue $10 billion worth of stock. Even if we ignore that fact and accept the premise that taxpayers have no intention to invest in the equity of existing banks, I cannot believe that investors would not invest in new banks, or would not invest in alternative institutions that could compete with banks. Thus, at best, the Treasury plan reallocates capital FROM new entrants to the banking industry and TOWARD the existing (and struggling) banks. What a plan for strengthing an industry -- to take from the young and strong and give to the weak and old! As I have written many times, public policy needs to ENCOURAGE entry, not discourage it. We cannot assume that taxes are lump sum, or have a known incidence. But recognizing taxation deadweight costs and uncertain incidence only increases taxpayer exposure to bank stock risk, which might cause them to reduce their bank industry investments MORE than the Treasury increases them! What a plan for strengthing the banking industry -- to decapitalize it! Another concern of this type: that banks could use the cash they obtain to buy back bank shares from the panicking public. After all, those shares look pretty cheap! In this case, the Treasury purchases literally puts the cash into a revolving door, without boosting bank capital. I have seen no economist account for this concern. This analysis also needs to relax the closed economy assumption ... more on that later today. But this is a good example of why I call this blog "Supply and Demand (in that order)" -- supply is too often ignored in public policy analysis. Proponents of Treasury bank stock purchases are guilty of a superficial analysis of the SUPPLY of private capital to the banking sector. That supply very much depends on public policy.